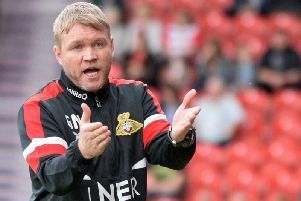 Doncaster Rovers head coach Grant McCann. Portsmouth extended their lead at the top of Sky Bet League One to three points after coming from behind to win 5-2 at 10-man Fleetwood. Pompey midfielder Ben Thompson's opener was cancelled out by Paddy Madden before Ched Evans' penalty, for Jack Whatmough's foul on Madden, gave Fleetwood a half-time lead. Fleetwood midfielder Dean Marney was sent off for his second yellow card in the 51st minute and Pompey took full advantage. Brett Pitman converted a penalty after Ross Wallace's challenge on Ronan Curtis, Anton Walkes fired them in front a minute later and Jamal Lowe struck twice in the final 10 minutes. Kazenga LuaLua fired a stoppage-time equaliser for Luton, who remain second after their seven-game winning streak was halted in a 2-2 draw at Walsall. Morgan Ferrier's first-half penalty, for Jack Stacey's foul on George Dobson, and Andy Cook's second-half strike put Walsall 2-0 up, but James Collins pulled one back and LuaLua struck in the fourth minute of stoppage time. Sunderland are four points adrift of the top two after being held 1-1 by Shrewsbury at the Stadium of Light. Josh Maja headed the Black Cats level before the break after Luke Waterfall's header had given Shrewsbury the lead. Barnsley registered their third straight win, 2-1 at home against Charlton, who they leapfrogged into fourth place. The Reds made a flying start as early goals from Brad Potts and Mamadou Thiam put them in control before Ben Reeves' strike for Charlton ensured an anxious finale. Charlton defender Chris Solly was sent off for his second bookable offence in the sixth minute of stoppage time. Ivan Toney struck a hat-trick as Peterborough cruised to a 4-0 win at Accrington to move up one place to fifth. Toney's first-half double gave Peterborough a two-goal interval lead and he notched his 16th of the season after Rhys Bennett had scored Posh's third. Doncaster stay seventh, but climbed to within a point of the top six as goals from John Marquis, Mallik Wilks and Danny Andrew secured them a 3-1 win at Gillingham, for whom Callum Reilly scored a late consolation. Scunthorpe beat Wycombe 1-0 at home courtesy of Kyle Wootton's early goal and AFC Wimbledon were held to 0-0 by Blackpool at Kingsmeadow. Plymouth striker Ruben Lameiras cancelled out Will Miller's early opener for Burton in a 1-1 draw at the Pirelli Stadium and Jordy Hiwula's second-half strike clinched Coventry a 1-0 home win against Southend. Bradford got their revival back on track by beating Rochdale 4-0 at Spotland as Nathaniel Knight-Percival, Ryan McGowan, Eoin Doyle's penalty and George Miller were all on target to seal their side's third win in four. Bristol Rovers secured their third straight win, 2-0 at Oxford, thanks to Alex Jakubiak's double in the lunchtime kick-off at the Kassam Stadium.